These large aerial Heartless can't be harmed by blows to the head, instead warping to a remote location on impact. They won't warp, however, if you attack their wings or tail, so focus attacks there. Go in equipped for aerial combat. The Phantomtail is an Emblem Heartless that appears in Kingdom Hearts 358/2 Days. It serves as a boss in Neverland. The Phantomtail is summoned to Neverland by Captain Hook's greed. Roxas defeats the Heartless, but its defeat is discovered by Pete, who resolves to summon an even more powerful Heartless in its place. 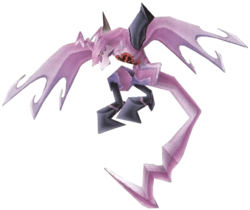 The Phantomtail is a large, draconic Heartless with pink skin. Its legs and shoulders are black. This Heartless is thinly built and has large, peculiarly-shaped feet; each foot has a black claw on its front and another on its back. The tip of the Phantomtail's long tail is hooked, as are the tips of its wings. Short, forward-facing horns appear atop this Heartless's head above each of its yellow eyes, and the Heartless emblem appears on its chest. The Phantomtail's name references its eerie, ghostlike appearance, as well as its tail. When battling the Phantomtail, Roxas must be careful not to strike the Heartless's head. Doing so causes the Phantomtail to warp to another part of the battlefield. Roxas can prevent this Heartless from warping by attacking its wings and tail, and he can track its movements with greater ease by staying Locked-On to it. Concept artwork of the Phantomtail by Tetsuya Nomura. This page was last edited on 6 September 2018, at 22:18.